Ask fellow campers about "Canning Creek COE" and nearby attractions. Another great COE campground. Had a pull through site on which we had a great view of the lake out of our back living room window. Had a covered table and work area, fire ring and water/elec hookups. Did require some leveling. We camped at Canning Creek COE in a Travel Trailer. Park is just a few miles from Council Grove, home to several Santa Fe Trail historic sites and home to the Hayes House--one of the oldest restaurants west of the Mississippi river. However, our Friday evening meal there certainly did not live up to the long standing reputation of the Hays House.Don't miss driving about 15 mi. south to visit the Cottonwood Falls Ranch and Tall Grass Prairie area. Beautiful old stone barn and house open for tours, along with many trails through the authentic tall grass prairie. The town of Cottonwood Falls, just a few miles south is also a great place to visit. This is a beautiful park. We arrived without reservations, and the attendants we very helpful, listing available spots and making personal recommendations - they were very friendly too! Sites are large, spacious, and include covered picnic tables and a grill. The Campground is adjacent to Council Grove Lake. We camped at Canning Creek COE in a Motorhome. This Campground is 22 miles from the Tallgrass Prarie National Preserve, and is 30 minutes south of I-70. Beautiful lake in the Flint Hills of Kansas. We truly enjoyed our stay in this COE campground. The majority of the sites are double wide and easy to level. And well spaced from your neighbors in most cases. Every site has covered picnic tables on concrete, new barbecue grills, great fire pits. There is abundance of beautiful shade and all sites have close view of lake, most are lakeside. Such a peaceful quiet campground, and the camp hosts are very friendly and helpful. There is a lot of green space for yard games, etc. Playground equipment is not the latest, but certainly adequate. 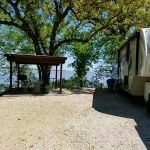 Several campsites have concrete pads and beautiful open views of the lovely lake. Verizon signal okay but not excellent, OTA TV is basically 2 channels. There is a hiking trail near the dam which is 1.4 miles through a beautiful wooded area along a stream and over walking bridges. Town is only 1 mile from lake and has everything you might need; excellent grocery store and nice hardware store. We hated leaving, and can't wait to return. It's a perfect place to camp. The only negative on this campground is the dump station is quite unlevel front to back, and small. We ended up using the dump station at another campground just next to Canning Creek. Which was certainly no big issue. We camped at Canning Creek COE in a Fifth Wheel. This lake has a small marina that advertises boat/kayak rentals. Hays House in town is a historic restaurant and nice place to dine. Tallgrass Prairie National Preserve is about 20 miles south and worth the trip. Topeka, the state capitol, is 49 miles away. Manhattan, 38 miles north, offers the Konza Trail which is a great place to hike. Campground has abundance of birds and wonderful night sky. Fishing available and popular here. Our first time to camp here. Great place: lots of trees and level paved camp sites. The staff went out of their way to make our stay good. I would camp here again without hesitation. We camped at Canning Creek COE in a Motorhome. Close to Council Grove. Make sure you eat at Hays House. Great food and great service. Excellent Corps park. Very quiet and easy in & out. Restrooms were the usual generic male/female and very clean. Only issue, not much water pressure in the showers because of the flow savers. We stayed a week and will return. 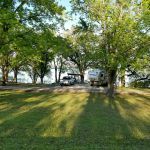 We camped at Canning Creek COE in a Motorhome. We love this place! Price reflects 50% Nat. Park Service Senior Pass discount. Just a great place that is clean and well kept. Concrete pads and patios that are covered. Very peaceful. The best bargain in camping we have ever found. We camped at Canning Creek COE in a Fifth Wheel. What a bargain! We got 50% off with our America The Beautiful Sr. Pass. They even asked us for it. Extra nice park. Paved roads, concrete pad and covered patio. Very quiet, site was on the lake. Nice little town only a few miles away with several good restaurants. Lots of history in the area. This was a very good experience. We'll go back for sure. We camped at Canning Creek COE in a Fifth Wheel. We stayed at a waterfront lot with 50 amp electric, water and a fire pit, but no sewer (#41) though other sites (group) do have sewer plus electric and water. Area was very clean and well maintained. Quiet at the time of our visit. Lots to see and do in the area if you are interested in history and the Santa Fe trail. Mobile WiFi worked at our site as did our Verizon phones (2 bars). Some TV reception with antenna. We camped at Canning Creek COE in a Motorhome. Beautiful Location, easy to get into. Lots of touristy things to do close by. Sites are well spaced with lots of shade trees. All new electrical pedestals in our section, site no. 8. Only downside I saw was there is a lack of shower houses for the number of sites available. Also the dump station, although easy to find and convenient, wouldn't be very easy to navigate with a bigger than say, a 28-30' rig. Worse for a trailer. We camped at Canning Creek COE in a Motorhome. One of several Corps of Engineer (COE) campgrounds on Council Grove Lake. Our site had a huge cement pad. There was plenty of room for our 40 foot motorhome and our Jeep. Each waterfront site had its own covered shelter, picnic table, grill and fish-cleaning station. No sewer at site, but good dump station on the way out. Bathrooms and showers were very clean, even during/after a "full" weekend of campers and boaters. Close to many historical sites, especially relating to the Santa Fe Trail. Small grocery store in town has everything you need. Would definitely stay here again. We camped at Canning Creek COE in a Motorhome. Are you affiliated with Canning Creek COE ?